Hi Everyone! 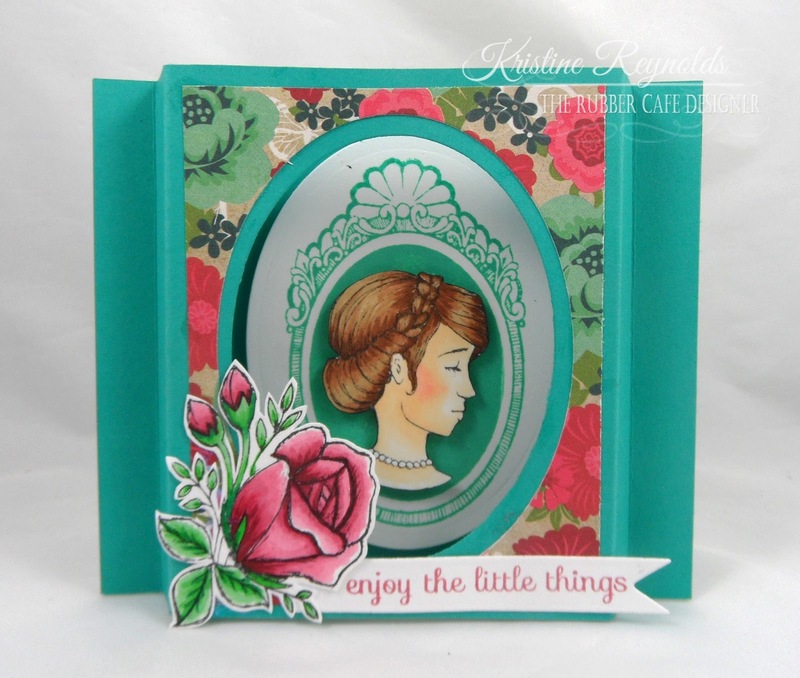 I have my third project from the April Creative Cafe kit of the month! 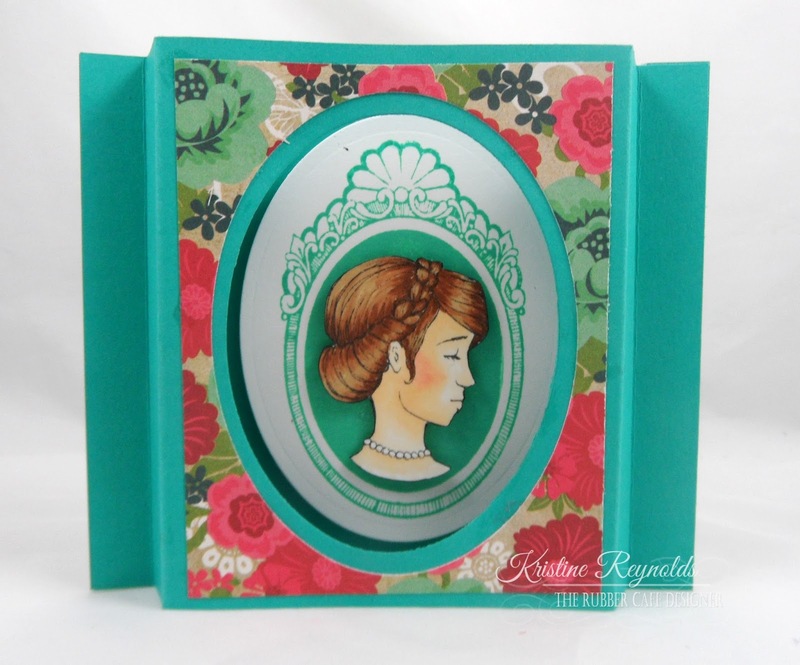 Today I created a shadow box card to share. 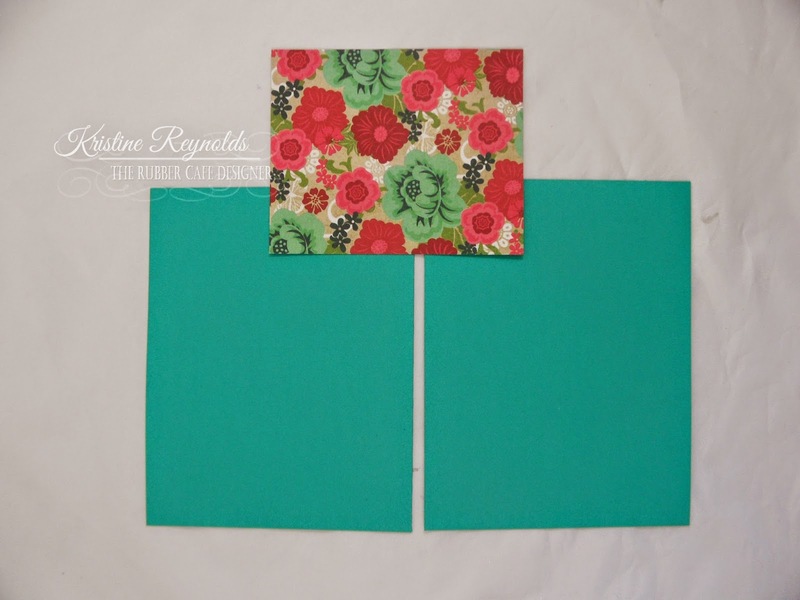 To create this card start with two panels of teal cardstock measuring 4 1/4" x 5 1/2" and a patterned paper panel that measures 4" x 3 1/4". 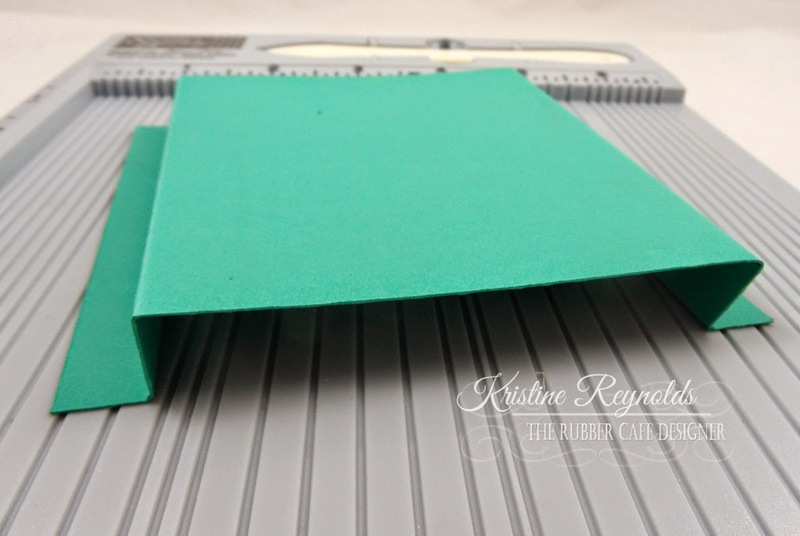 Score each panel of card stock at 1/2", 1", 4 1/2", and 5"
The pieces will fold on the lines like this. 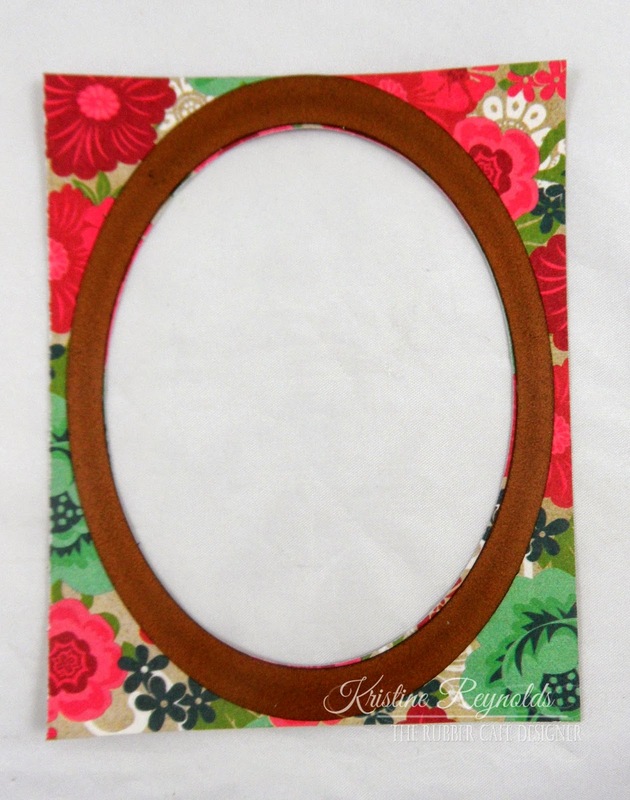 Lay the patterned paper on the front panel and run through a die cut machine with and oval Spellbinder die. 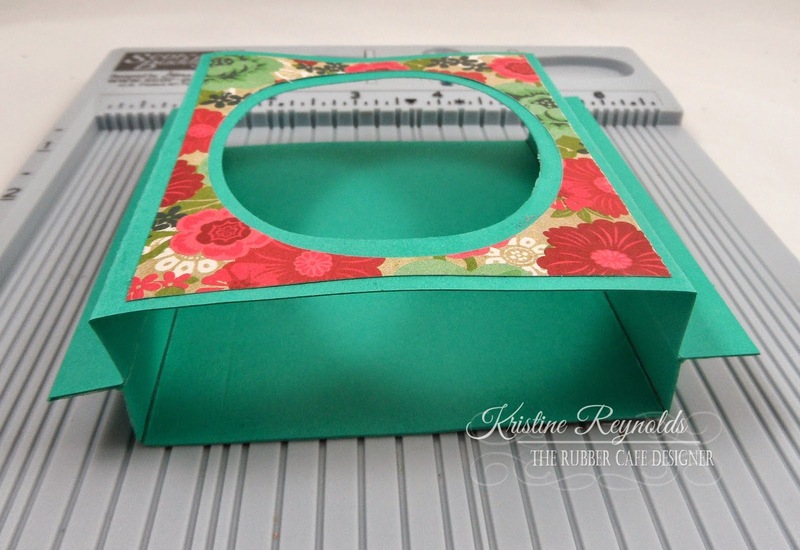 Remove the patterned paper panel and through the die cut machine with the next size up oval die. Adhere to front panel with Scrap Happy Glue. 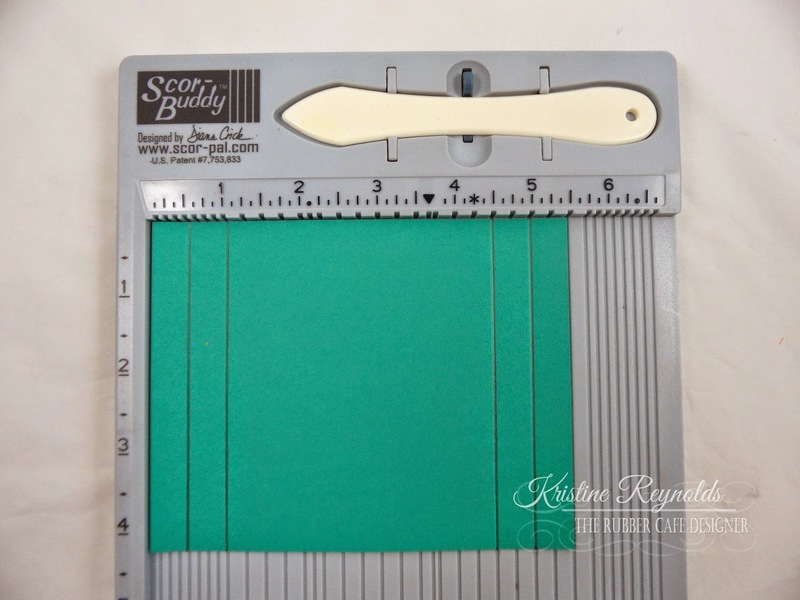 Fold on the score lines and then adhere to the back panel with Score-tape. 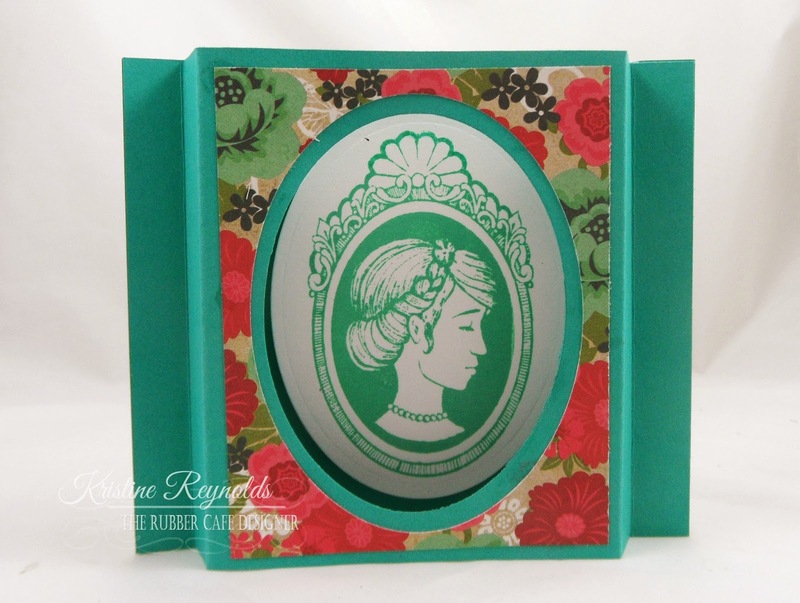 Stamp the Cameo on a white die cut oval panel with Aquamarine ink and adhere inside the shadow box. Stamp the cameo with Memento Tuxedo Black ink and color with copic markers. 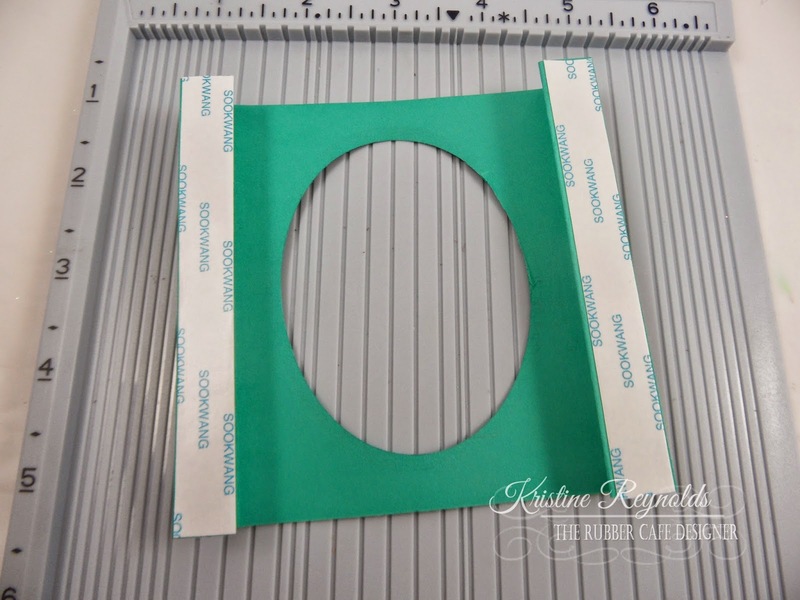 Cut out the face and adhere to the card with 3D foam squares. 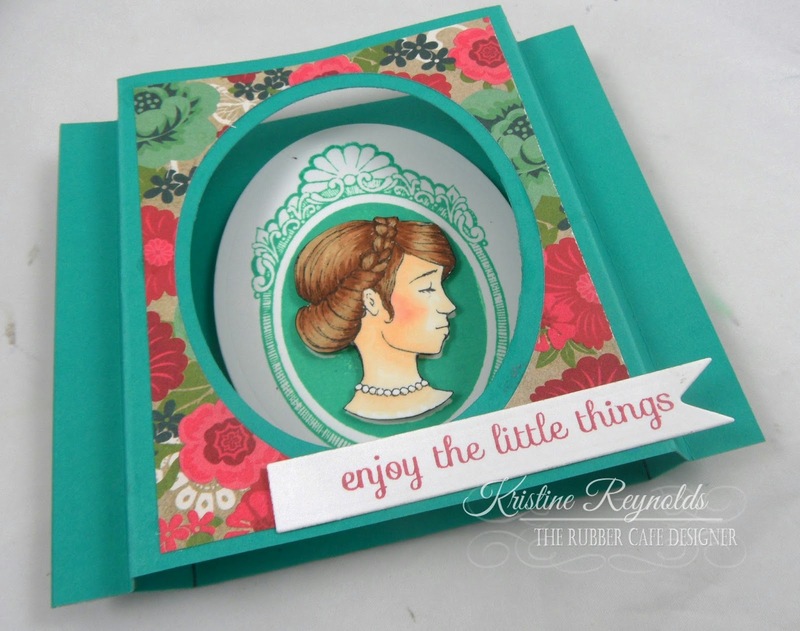 Stamp sentiment on a hand cut tag and then adhere to the front of the card with Scrap Happy Glue. Stamp flower on a white scrap and color with copics. 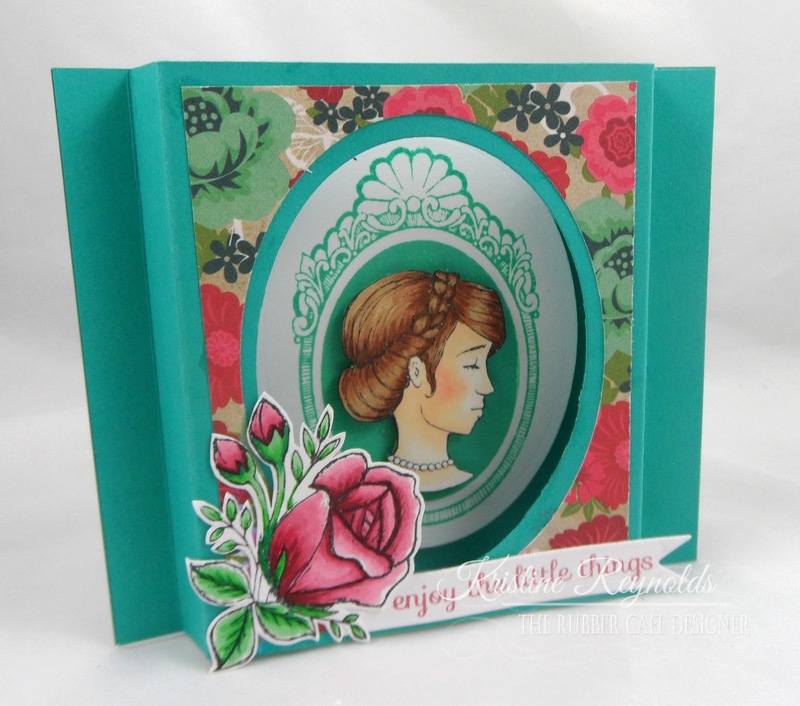 Fussy cut out the flower and adhere to the card front. Here's a flat view so you get a better idea of how it all goes together. 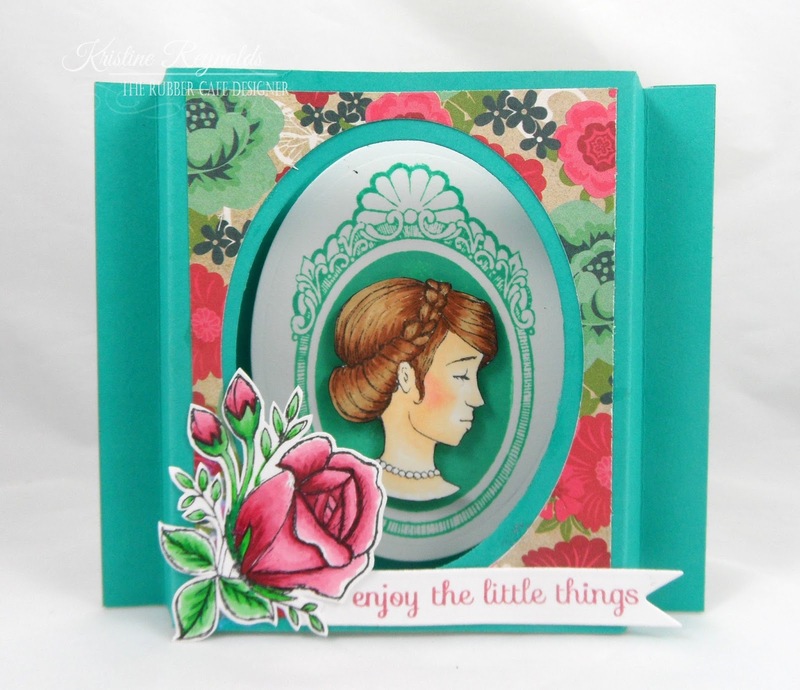 I hope you enjoyed today's Creative Cafe' kit card! I'll have my final card for the month next week so be sure and check back! Adhesives: The Rubber Cafe'-Scrap Happy Glue, Score-tape. 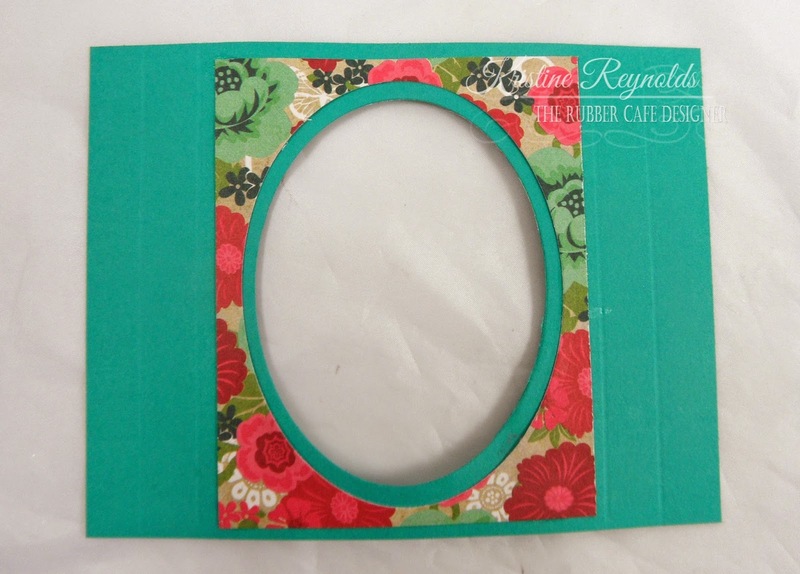 Embellishments: The Rubber Cafe'-Creative Cafe' KOTM: flower, lace trim, and brad.